Filipe Leite’s extraordinary ride from Calgary to Tierra del Fuego was an undertaking he had dreamed of since he was a student in Bolton. From the beginning of sentience, humankind has had the urge to explore. From the great migrations that began with the first dispersals of homo sapiens to the romantic period of exploration from the 15th to the early 20th century, people have been seized with wonder and curiosity. By foot, by ship, by horse, by mule, they went out continuously from Africa, China, Scandinavia and Europe to discover what lay beyond. Driven by a thirst for knowledge and the hope of riches, explorers discovered, mapped and exploited the landmasses of the planet. 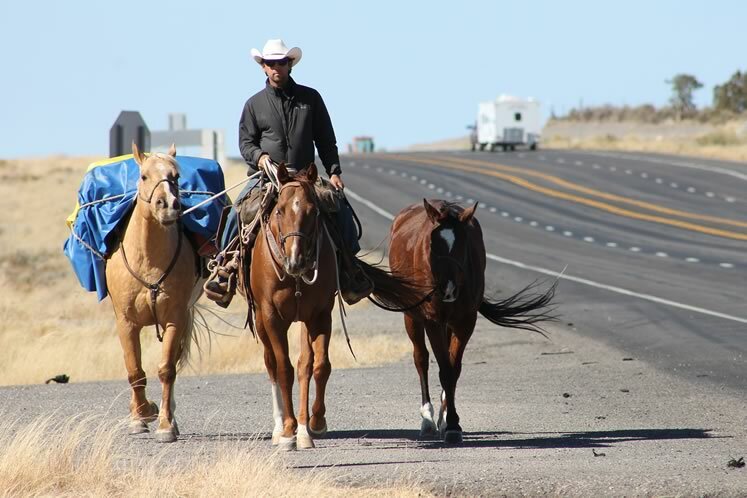 Filipe on Bruiser, with Frenchie and Texas (Dude’s predecessor) on a highway in northern New Mexico. Courtesy Filipe Leite. It is through those expeditions that globalization began. Discoveries of cultures, species and resources over the centuries led to an explosion of industry, trade and innovation in the 18th and 19th centuries. We tend to think the age of rugged exploration is over, yet it is not. It has turned to the waters of the planet, to space, to the environment, and to human experience – the testing of physical and emotional endurance by modern explorers such as Filipe Masetti Leite. 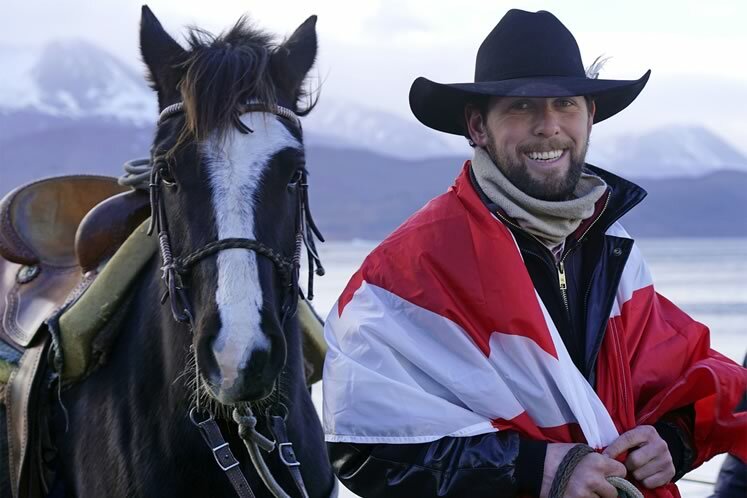 Filipe undertook an extraordinary three-year journey on horseback from Canada to the tip of South America. His objectives were to meet the physical and mental challenges of a long ride and, as a journalist, to record the lives and conditions of people in the ten countries he would cross along the way. His book Long Ride Home, to be released in English this summer, is his account of a trek that is the stuff of legend. Filipe is a Brazilian whose family lived in Caledon from 1995, when he was nine, to 2005. 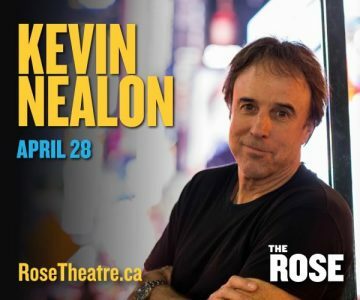 He went to school in Bolton and Caledon East, and then did a journalism degree at Ryerson University, graduating in 2010. Along the way he worked for both a local newspaper and radio station in Bolton. The family had emigrated from a farm in Brazil where Filipe had been close to the land and horses and where he had been taught riding by his father before he could walk. That connection with the outdoors and horses was lost but not forgotten with his move to Canada. A backpacking trip to the Calgary Stampede as a teenager reignited his interest in riding and roping, and rekindled an idea planted by his father when he was a child – to become a long rider. 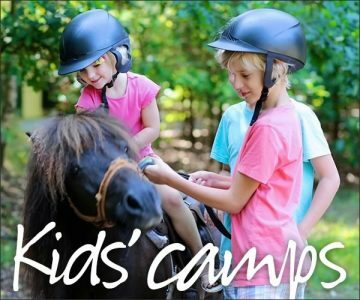 A long rider is someone who undertakes a journey of months to years on horseback and is acknowledged by The Long Riders’ Guild, an international organization of equestrian explorers. Filipe’s family greeted him in Barretos: (left to right) his dad Luis, sisters Paolla and Izabella, mom Claudia, Filipe and Dude. Photo by Barbara Nettleton. Inspired by his father’s unfulfilled desire to become a long rider and the stories he told young Filipe about author and rider Aimé Tschiffely’s 1925 long ride from Buenos Aires to New York (recounted in his 1933 memoir Tschiffely’s Ride), Filipe conceived his plan to ride from the Calgary Stampede to his hometown Espírito Santo do Pinhal in the state of São Paulo, Brazil – a journey of 16,000 kilometres. After two years of intense study and careful planning, he was well aware of the kind of conditions he would face during a ride through the American west, Mexico and Central and South America. He also knew what he would need. Starting with nothing, he had to raise funds and find horses and equipment. It was tough. At first, no one was interested. But finally he got a break. OutWild TV, a new outdoor television channel, thought he could be a star for them. They provided funding and recording equipment. Other sponsors followed with more supplies, and horses and tack were donated. Feeling overwhelmed by people’s generosity, by the time Filipe set out he was well equipped, well prepared to deal with the expected, and better able to face the unexpected. On July 8, 2012, when he left the Calgary Stampede on what he called his Journey America, he was excited and terrified. On the cold day Filipe Masetti Leite arrived on Pablo Picasso in Ushuaia at the tip of South America, he wrapped himself in a Canadian flag sent to him by Orangeville mayor Rob Adams. Photo by Barbara Nettleton. “Planning can literally mean the difference between life or death. 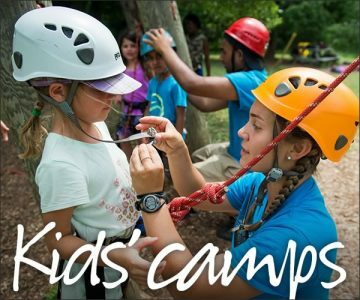 These expeditions have no rulebook. Things happen that you are not expecting. But, when you plan so much and you have a solid strategy, it is not luck that gets you through them,” he says. 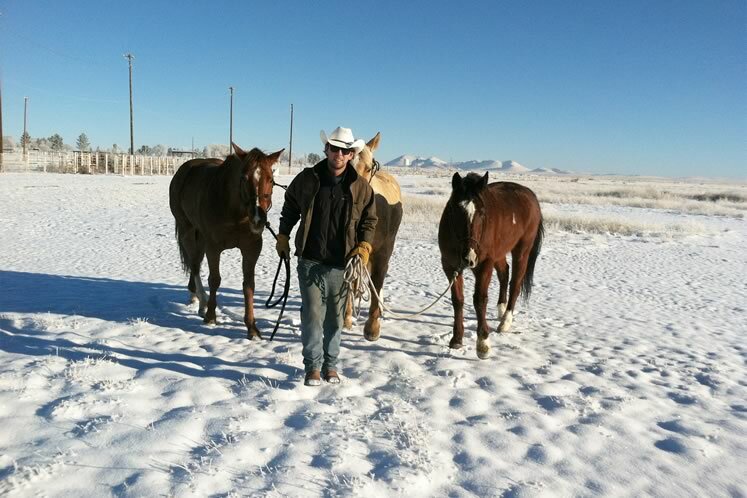 Snow caught up with Filipe and his horses in Marfa, Texas. There would be more ahead. Courtesy Filipe Leite. So at age 25 he set off on his first long ride. His unprecedented expedition threw everything at him – mountains, plains, deserts, drought, rain, snow, earthquakes, sandstorms, and ice, mud and electrical storms. He encountered recklessly driven transport trucks, generous strangers, drug cartel members and intransigent bureaucrats. Although at times he had the companionship of his father and friends, he spent much of the time riding alone. To say this journey was not for the faint-hearted would be an understatement. The conditions were often extreme. He rode soaking wet. He slept in a tent on the hardest ground. He slept in the saddle. He rode hungry and thirsty. He froze. He sweated. 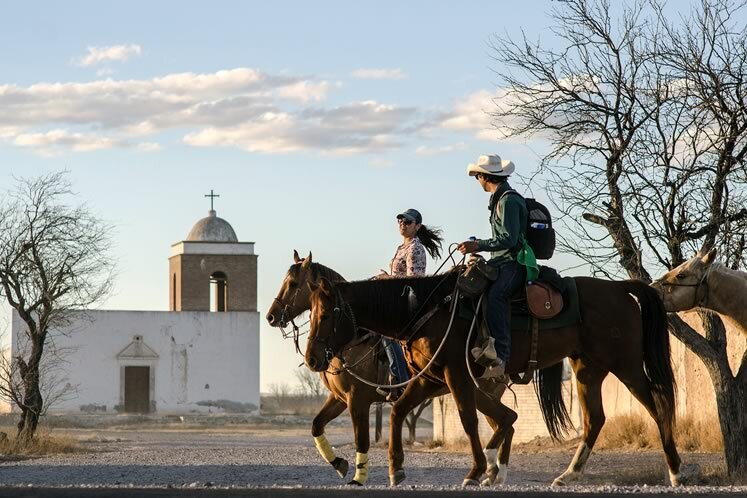 A local horsewoman accompanied Filipe as he rode into Mexico through Jiménez. Photo by Barbara Nettleton. Through it all, his first priority and closest friends were his horses: Bruiser, a quarter horse, Frenchie, his pack horse, and Dude, a mustang who joined the group in New Mexico. Inevitably over such a long ride problems came up. Bruiser developed a fungal infection in Central America from the heat and humidity. Frenchie was hit by a truck. Dude got a deep cut on one leg. At one point Filipe had spent so much money on vets he ran out of funds for food and faced the prospect of watching the horses starve. But by then people were following his regular blog and after he posted an appeal, food was donated. It is not an exaggeration to say that over the long, solitary days, the horses became his best friends. His responsibility for the horses’ well-being, along with their warmth and personalities, helped to keep his spirits up. And Filipe recounts how he became a part of the herd, sharing the same schedule and rhythms – to the point that when Filipe peed, so did the horses. His most profound discovery was the goodness he found in people – among the poorest, the richest, the humble and the criminal. He travelled through some of the most lawless places in the western hemisphere. But everywhere he went, he was met with kindness, generosity and respect. These encounters were soul-saving and life-saving. He was warned away from some areas. He was fed. The horses were fed and cared for. Filipe went through more than seven pairs of boots (and over 300 horseshoes) on his journey, starting with the ones on the left, which he donated to the Bata Shoe Museum after his ride. 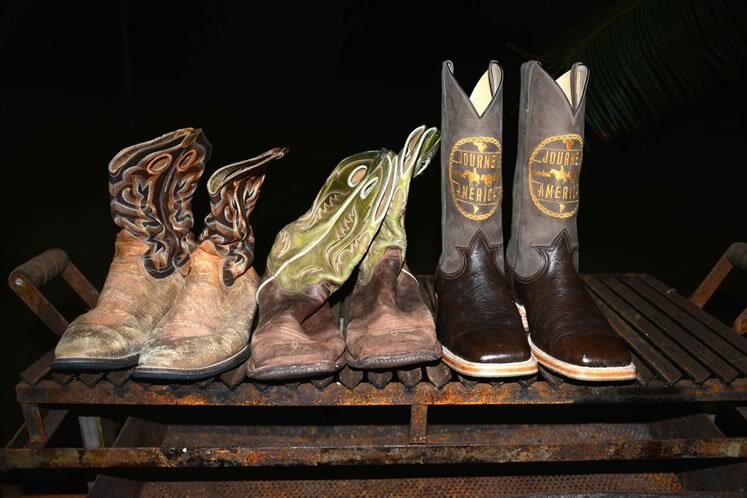 He wore the green boots through the southern U.S. and the third pair were a gift presented when he arrived in Barretos. Photo by Barbara Nettleton. In the border mountains between Honduras and Guatemala – a place with one of the highest murder rates in the world and controlled by drug cartels – he was escorted by one drug lord on one side and handed off to another on the other side. The second man met him with beer in hand and two pistols at his waist and took him home to his mansion. There Filipe and his horses were treated as honoured guests and he witnessed the evident love the man had for his family. In other dangerous areas, groups of armed villagers sometimes escorted him through risky territory. “There were places where I thought it might be unwise to reveal I was a journalist,” Filipe says wryly. 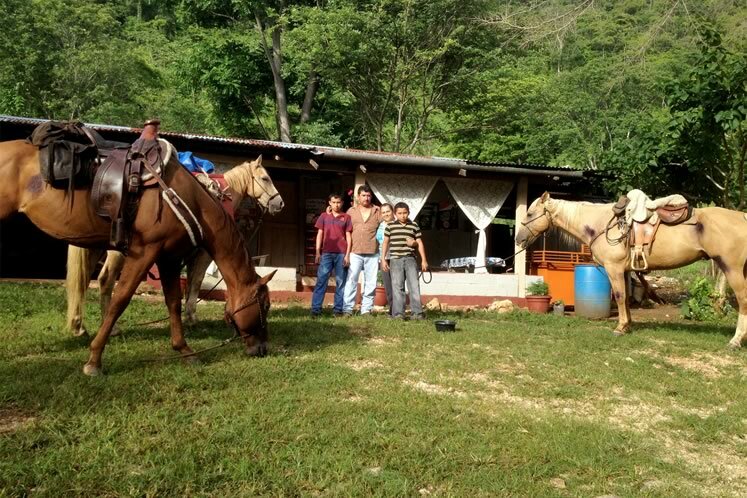 Hessler Reyes Dones and his family offered hospitality to Filipe and his horses in northern Guatemala. Courtesy Filipe Leite. He also had firsthand experience with grinding poverty. Yet families who lived in miserable shacks by the side of the road were heartbreakingly generous. “One family in Guatemala fed me the only chicken they had,” he says, still filled with gratitude and admiration. He learned a lot about the cultural links between poverty and crime, and saw how climate change is exacerbating the problems, raising temperatures and reducing rainfall. 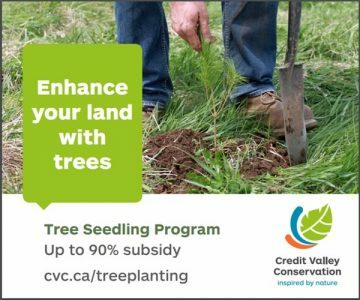 Vast stretches of land recently farmed are now desert. At the same time, he notes, people have access to information. They learn to idolize the North American way of life. They, too, want the nice house, the nice car, plentiful food and personal safety. For some the solution is the drug business, with the result that their countries are convulsed by perpetual wars between those feeding the North American demand for drugs and those trying to end the trafficking. And Filipe met others trying to take a different route. Refugees prepared to walk for months toward the American border. To flee starvation and violence, men, women and children, old and young, were making the trek by foot northward in the hope of bettering their lot in life. He describes it as one of the hardest exoduses in the world. But increasingly the desperate are turned back at the border. 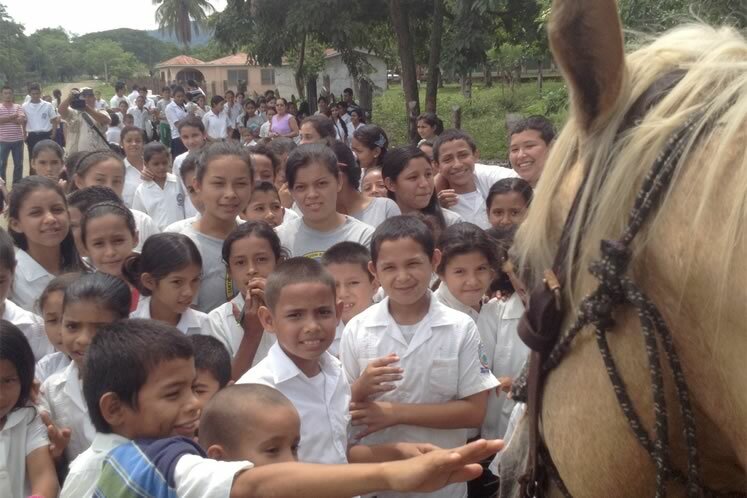 On a rural road in Honduras, an entire school turned out to say hello to Filipe and stroke Frenchie. Courtesy Filipe Leite. Still, no matter which path they had chosen, people were almost invariably good to him and the animals. 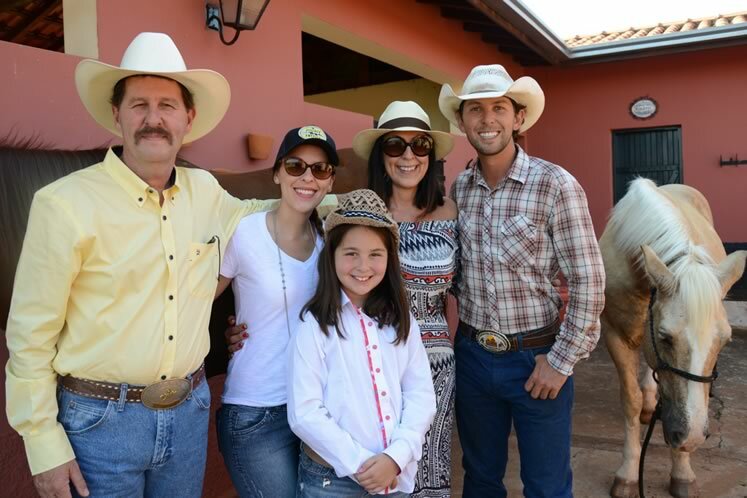 Filipe’s final stop before arriving home was at the opening of the annual rodeo in Barretos, Brazil. When he and his three horses entered the rodeo arena, they were welcomed with wild cheers from a crowd of 40,000. A statue of Filipe and his horses is now permanently installed on the rodeo grounds. Filipe assumed the last short leg home to his birthplace would be a quiet denouement. But on day 803 of his journey, two years and two and a half months after he’d left Calgary, he was greeted by 500 riders who jubilantly escorted him the final few kilometres into Espírito Santo do Penhal. He was dirty, his clothes were in rags, he was exhausted, in tears – and happy. He had overcome incredible hardship to achieve what he’d set out to do, and he was embraced as a hero. 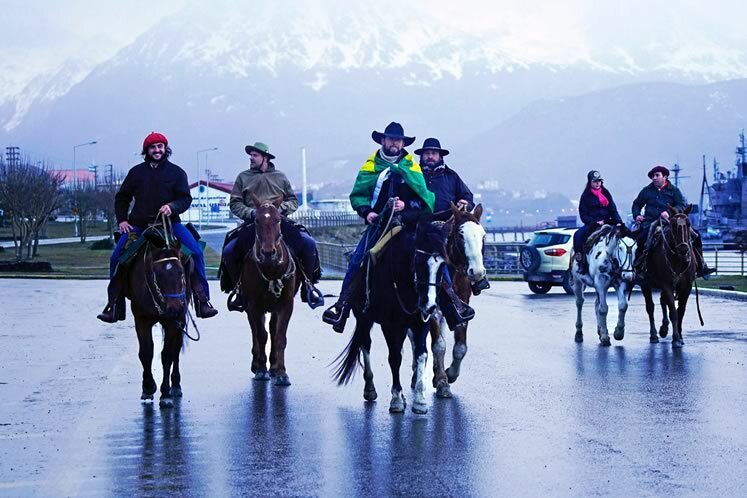 At journey’s end in Ushuaia, a smaller crowd of devotees welcomed Filipe and Pablo Picasso, including a group of local gauchos and his sister Izabella. Photo by Barbara Nettleton. And that might have been the end of Filipe’s journey. But, no, on his arrival home he was invited to visit the Barretos Children and Young Adults Cancer Hospital which provides free cancer care and support – and he was deeply moved by the experience. And so a year later, in April 2016, he set out on Journey America 2 as a way to repay all the generosity he had experienced on his first trip by raising money and awareness for the hospital. His goal this time was to ride south from Barretos through Uruguay and Argentina, across the Patagonian mountains to Tierra del Fuego, at the southernmost tip of the continent – another 6,000 kilometres. This time two horses were donated in each of three countries he crossed (later returned to their owners), so none of the horses had to travel as far as his first ones had. Although he was better equipped, this trip, too, had hardships, including blinding snowstorms in the mountains. And it had heartbreaks. The worst occurred a mere 100 kilometres from the end of his journey when one of his horses, Sapo, died after eating contaminated food. After a 15-month ride, Filipe arrived on a cold day to the cheers of a small gathering in Ushuaia, Argentina, the most southerly city (pop. 57,000) in South America. Although the crowd was smaller than in Brazil, his final accomplishment was larger. To earn an official status, long riders are required to ride over 1,600 kilometres. By the time he reached Ushuaia, Filipe Masetti Leite had ridden over 22,000 kilometres, one of the longest rides in history. He had become the youngest person ever to ride more than 20,000 kilometres. 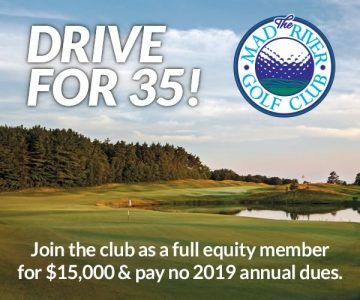 And he had raised more than $30,000 Cdn for the cancer hospital. Recently, Filipe has been touring with the original Spanish version of his book, Cavaleiro das Américas, published by HarperCollins in 2017. He will returning to Canada this summer to promote the English version. 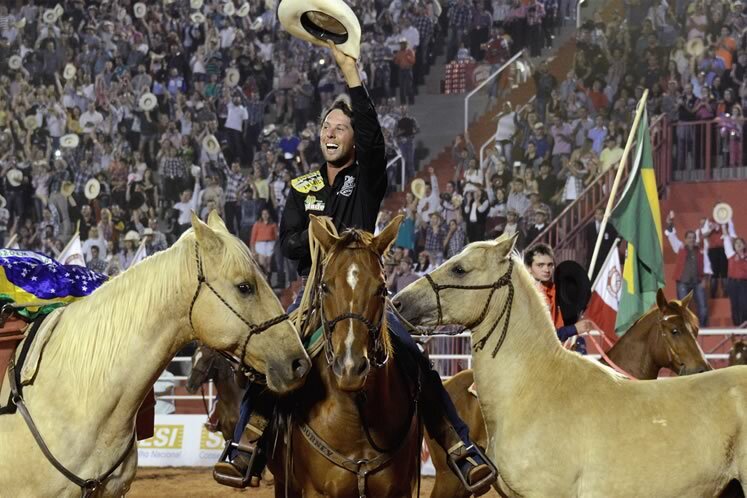 After 16,000 kilometres, Filipe rode into the Barreto’s Rodeo Arena with Frenchie, Bruiser and Dude and was greeted by the cheers, applause and tears of a crowd of 40,000. Photo by Barbara Nettleton. For information on Filipe Masetti Leite’s Canadian book tour for Long Ride Home, follow him on Instagram or Twitter @filipemasetti. Mi admiración por la Azaña realizar, por creer en los sueños, hacerlos realidad, solo filipe cargará en su espíritu y alma todos lo bueno, maravilloso y espectacular de su aventura, por no haberse dado por vencido en sus peores momentos de su viaje la perseverancia de insistir y atravesar a las difícutades extremas climáticas y en algunas humanas, convivir con la pobreza, ver poder, lujos, injusticias, apreciar las bellezas naturales que hay en nuestro planeta y en su último tramo se le suma la solidaridad como la lucha sobre el cáncer para niños, me llena de orgullo. Solo me queda aplaudir de pie y decirle mil gracias, gracias por hacer QUE LA VIDA SEA BELLA!!! Gracias filipe Massetti Leite por tu Humildad… abrazo grande desde Argentina!!! 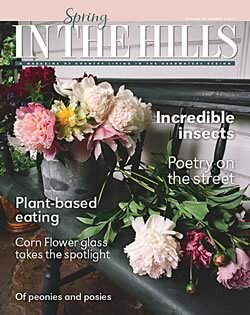 Excellent, well written article. Fabulous photos. Phenomenal journey. We followed both of his journeys and we participated as sponsors. He really is an inspiration. Pam you really captured the spirit of Filipe. And I love Barb Nettleton’s beautiful photographs. 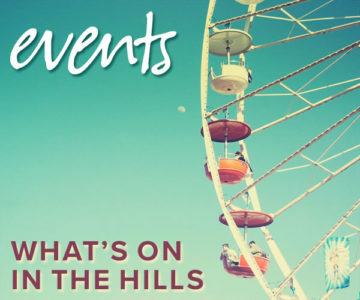 Lots of talent in those hills.